For testing iOS apps, we used an iPod Touch with 32GB. For testing Android apps, we used a Nexus 7 (2013) with 32GB. Because the speed of the mobile devices is so much slower than our desktop machines, we tested adding 10, 100, and 1000 items or lines instead of 100, 1000, and 10000 like the desktop versions. This was only necessary when the BeginUpdate and EndUpdate methods were not called. Please notice that the FMX charts have a logarithmic y-axis for execution time. With FMX, execution times vary so greatly between a small number of items and a large number of items that filling a TListBox or a TMemo with 1000 items would swamp out the other results and make them appear tiny and indistinguishable. Our first tests are with filling the TListBox on an iOS device. Since Delphi XE4, Delphi has supported deploying to iOS devices. Note that the Delphi XE4 app was compiled with debug. Delphi XE5 and XE6 can deploy release versions directly to the device without requiring certificates. However, this was not true with Delphi XE4 but as we will see, it doesn’t seem to have slowed the app down. Delphi XE6 does well when filling a TListBox on an iOS device. For 10 items, it manages to be over 2x faster (416 ms) than the slowest version, Delphi XE4, when BeginUpdate/EndUpdate are not called. At 100 items, it is still 1.5x faster (11.9 secs) than XE4. Only at 1000 items is it slowest, however, “slowest” is relative here as Delphi XE5 which is fastest still took over 16 minutes. When BeginUpdate/EndUpdate are used while filling a TListBox, Delphi XE5 is the fastest. Delphi XE6 is last in this case, but the differences are minor as it fills a TListBox with 100 items in 189 ms compared to XE5’s 102.3, with 1000 items in 3.1 secs compared to XE5’s 2.2 seconds, and with 10000 all of the Delphi’s are slow, taking 2.8 minutes for XE5 and 3.19 minutes for XE6. It must be mentioned that Delphi XE4 did well filling a TListBox when the BeginUpdate and EndUpdate methods are called, nearly equaling XE5. This is important as Delphi XE4 completely dominates when filling a TMemo, with or without calls to BeginUpdate/EndUpdate. Delphi XE6 is in second managing to beat XE5 in every case except when filling a TMemo with 10 lines (51 ms vs 33 ms). Our last platform is Android. Note that only Delphi XE5 and XE6 can target this platform. 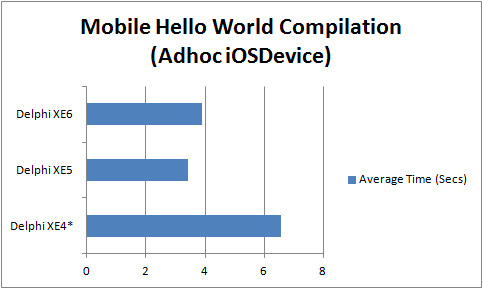 No clear winner emerges for the Android platform, though Delphi XE6 is the all-around better Delphi for Android. If you look at the filling TListBox chart, Delphi XE6 is faster at filling a TListBox with less than 1000 items and no BeginUpdate/EndUpdate. However, when the BeginUpdate and EndUpdate methods are called, Delphi XE5 is faster (157 ms at 100 items, 941 ms at 1000 items, and 41 seconds at 10000 items. When filling a TMemo, Delphi XE5 and Delphi XE6 are essentially tied except for one important caveat. Delphi XE5 is almost twice as fast as XE6 at adding 10 lines (and no BeginUpdate/EndUpdate); however, that does not mean much as it is only a difference of 22 ms. The glaring discrepancy is that Delphi XE6 is over 7x faster than XE5 in filling a TMemo with 1000 lines (and no BeginUpdate/EndUpdate). It takes 20 seconds for XE6; over 2 minutes later XE5 finishes. 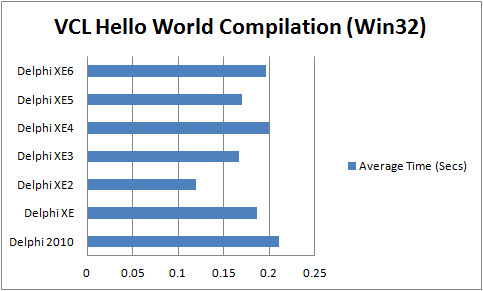 That’s it for the Hello World project execution speed results. 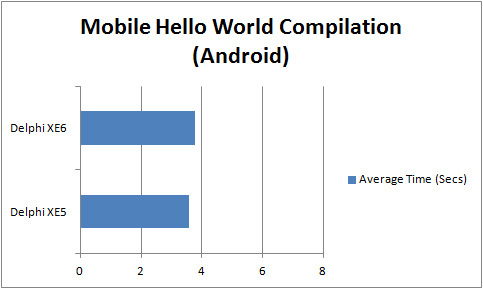 The Hello World project is a simple application/app that provided some interesting comparisons between the different Delphi versions on various platforms. It showed the work that needs to be done to improve the FMX versions. However, the Hello World project is limited and truly only tested a couple “standard” controls (TListBox and TMemo). Next week, we are going to show speed results from sample applications using the Inference Engine Component Suite (IECS). The IECS is a large component library (96K lines of engine code and another 48K LOC for dialogs) for developing expert systems with Delphi. It uses lots of interfaces, generics, parsing/string manipulation, and 100s of classes. It works from Delphi 2010 through XE6 and for all platforms that Delphi supports. It should provide very interesting non-visual execution results. We are going to follow that up with tests using the RiverSoftAVG SVG Component Library (RSCL). The RSCL will only test Delphi XE2 through XE6. However, it renders SVG files using low-level canvas operations (gradients, paths, text, etc) and is available for VCL and FMX. It uses GDI+ for VCL (which is a software renderer with comparable features to the FMX TCanvas) so it should provide a good test of the FMX DirectX and OpenGL hardware-based rendering. The RSCL is also able to build SVGs using the FMX shape primitives (TRectangle, TPath, TText, etc); it should reveal any optimizations (or lack thereof) Embarcadero has been doing with the low-level primitives from which most FMX controls are built. That’s it for this week. I hope you are enjoying this series of blog posts. Happy CodeSmithing! This entry was posted in Coding on May 26, 2014 by tgrubb. We’re back to continue this string of blog posts into the performance differences between Delphi 2010 through Delphi XE6, and between all platforms. This week we continue our speed tests from last week by finishing up our performance tests for the Hello World project from the introduction. Last week, we saw that performance differences in the VCL are minor. With the Win32 version of the FMX Hello World application, it was more interesting. When filling a TListBox, at small number of items, the XE2 version is fastest. Surprisingly, at higher numbers of items, Delphi XE3 is fastest. For filling a TMemo, Delphi XE6 rocked and managed to be faster than every other version of Delphi except XE4 when not using BeginUpdate/EndUpdate, and faster than all other versions of Delphi when using BeginUpdate/EndUpdate (even the VCL versions, though this comparison is not really valid as the VCL TMemo, when BeginUpdate/EndUpdate methods are not used, draws every string as it is added while the FMX TMemo does not)! This week, we are going to continue our tests with Win64 and then investigate non-windows platforms. As we noted in our update last post, please notice that the FMX charts have a logarithmic y-axis for execution time. With FMX, execution times vary so greatly between a small number of items and a large number of items that filling a TListBox or a TMemo with 10000 items would swamp out the other results and make them appear tiny and indistinguishable. 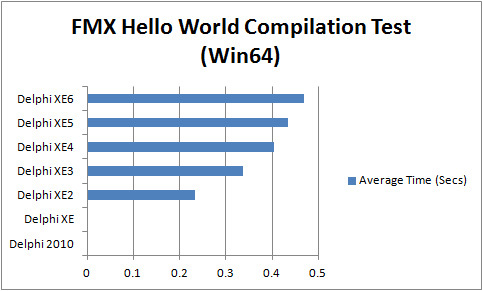 The FMX Win64 speed tests for filling a TListBox hold no new surprises and closely mirror the Win32 tests. With the FMX Hello World application, at small number of items, the XE2 version is fastest using the TListBox. However, as mentioned in the update to last week’s post, the Delphi XE2 TListBox is crippled when clearing items (which is not reflected here) and shows exponential times in clearing the list box. At higher numbers of items, Delphi XE3 is fastest. Delphi XE6 manages to be insignificantly faster than Delphi XE4 and XE5 when not using the BeginUpdate/EndUpdate methods. Using BeginUpdate and EndUpdate, Delphi XE6 is slower than every prior version until we get up to 10000 items where Delphi XE2 is the slowest. 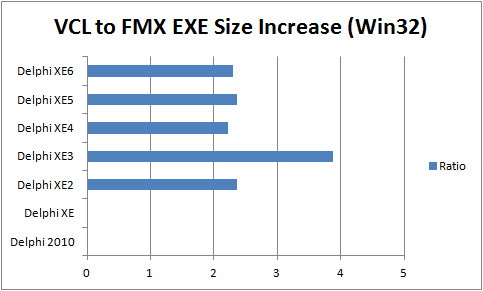 Comparing Win64 FMX to Win32 FMX execution, surprisingly only Delphi XE2 manages to be faster in Win64 on a Windows 64-bit OS and machine (though even it cannot do it when using BeginUpdate/Endupdate methods at 10000 points). 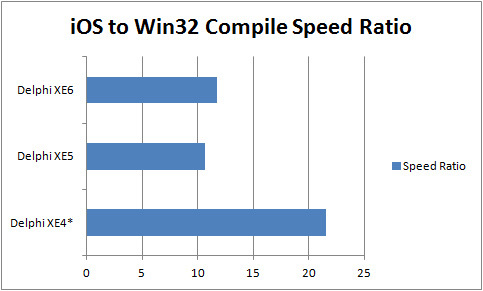 Delphi XE3, at a small number of items is faster filling a TListBox in Win64 than Win32. Delphi XE4, XE5, and XE6 for some reason are all slower filling a TListBox in Win64 vs Win32 when executed on a Windows 64-bit OS and machine. Filling a TMemo, the picture changes. Because the FMX version of TMemo does not draw each line as it is added, the Delphi versions manage to maintain a speedy pace. Delphi XE4 is fastest when filling a TMemo with no BeginUpdate/EndUpdate method calls. Delphi XE6 is strong again and is the fastest when using the BeginUpdate/EndUpdate methods. 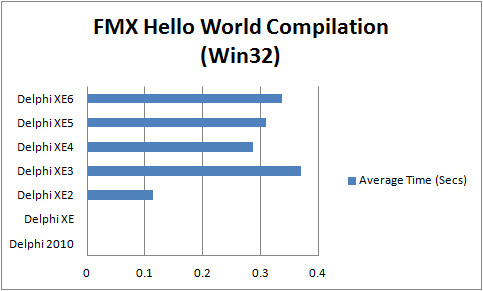 For all versions of Delphi except for XE2 in some cases, the 64-bit version of the FMX Hello World application is faster than its 32-bit FMX counterpart when filling a TMemo. Now for the really exciting tests, how do the different versions of Delphi do on other platforms? Our first tests will be the Hello World application running on OSX. Since Delphi XE2, there has been support for creating applications for the Mac. For our tests, we use a 2.3 GHz Intel Core I7 Mac Mini with 4GB 1600 MHz DDR3 RAM running OSX 10.9.2. The results for filling a TListBox in OSX is interesting. In general, Delphi XE3 is the fastest when BeginUpdate/EndUpdate are not called. When BeginUpdate and EndUpdate are called, Delphi XE5 has a very strong showing, beating out all other versions except where Delphi XE3 manages to eke out a win by 1/10 of a second for 10000 items. Delphi XE6 gives competent but not winning numbers. It is faster or practically equal to Delphi XE4 and XE5 when not using the BeginUpdate/EndUpdate methods. If BeginUpdate and EndUpdate are called, Delphi XE6 is faster than XE2 and XE3 for 1000 items and under, and almost tied with XE3-XE5 at 10000 items. When filling a TMemo, Delphi XE4 is particularly strong on OSX. Delphi XE4 is faster than every other version. Delphi XE6 gives an excellent showing and is in second place for all TMemo tests, and actually equalling XE4 with 100 items and BeginUpdate/EndUpdate calls. Unfortunately, the Windows machine used for testing is not exactly comparable to the Mac Mini. However, the Windows Machine specs (Windows 7 64-bit Intel I7 930 @ 2.8 GHz CPU, and 6 GB RAM) are *close* to the Mac Mini specs (OSX 64-bit Intel I7 @ 2.3 GHz with 4GB RAM), so it will be very interesting to do comparisons of the FMX Win32 vs FMX OSX Hello World. 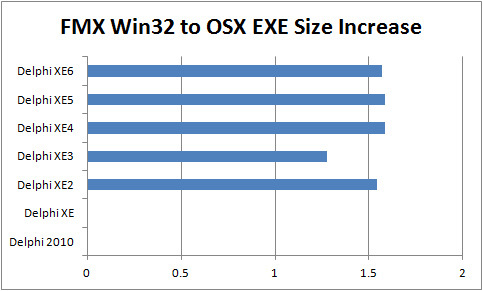 Ratio of Win32 to OSX execution speed for TListBox in Delphi XE2 to XE6 (FMX). Note that test machines are not exactly comparable. Surprisingly, adding items to a TListBox is faster on a Mac when the BeginUpdate and EndUpdate methods are ***not*** called. Once, BeginUpdate and EndUpdate are called, we get the expected results and the Windows box wins. 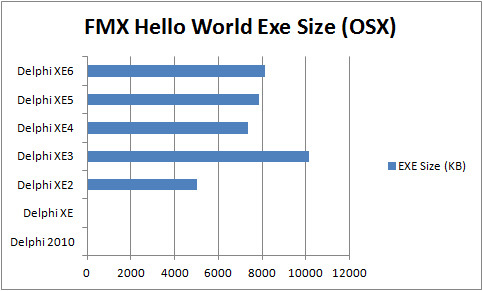 Ratio of Win32 to OSX execution speed for TMemo in Delphi XE2 to XE6 (FMX). Note that test machines are not exactly comparable. Adding lines to a TMemo is a rout and the Windows application wins across the board and for all versions of Delphi. Finally we get to the interesting part of these series of blog posts. 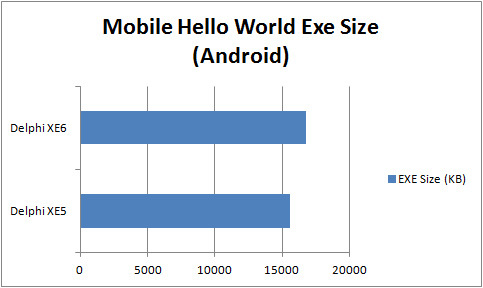 In the previous post, we looked at compilation speed and EXE size for the Hello World project from the introduction. 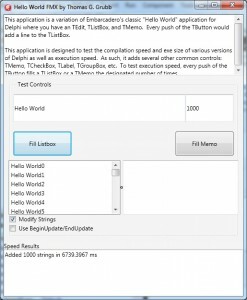 In this section, we are going to look at the execution speed for the Hello World project in Delphi 2010 to Delphi XE6, for Win32, Win64 (Delphi XE2-XE6 only). Next week, we will finish the Win64 FMX tests and then also show OSX (Delphi XE2-XE6 only), iOS (Delphi XE4-XE6 only), and Android (Delphi XE5-XE6 only). The Hello World project fills a TListBox or a TMemo with a number of strings with every click of a button. In our speed tests, we tested adding the string “Hello World” with a number appended after it. The button click adds 10, 100, 1000, or 10000 strings at a time. We are also going to test adding strings inside a BeginUpdate/EndUpdate, which should be significantly faster unless something has been broken. Note that the charts display the execution time on the y-axis in milliseconds. The number of strings added as well as if BeginUpdate/EndUpdate were used are on the x-axis. Except for the VCL charts, the y-axis is logarithmic as the amount of time to add strings goes up exponentially with FMX applications. The first test is with the VCL version of Hello World in Win32. Both the TListBox and TMemo pass their control handling to the underlying Windows control so unless Embarcadero broke something, we should see little change between the different versions of Delphi. And that is what we see. Every version of Delphi is able to fill a TListBox with up to 10000 strings in under a second. Note that using BeginUpdate and EndUpdate methods speed up the execution by over 30x! Every version of Delphi is able to fill a TMemo with up to 10000 strings in just around 6 seconds with the BeginUpdate/EndUpdate tests finishing in a sixth of the time. 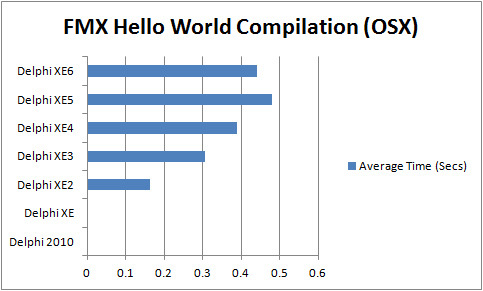 For the 64-bit Hello World application, we can only test with Delphi XE2 through XE6. There are also no significant execution speed differences between the Delphi versions in Win64. It is, however, gratifying to see that the promise of Win64 Delphi applications running native in a Windows 64-bit OS and 64-bit CPU is realized as the Win64 versions run around 10-25% faster. Even though 64-bit applications are larger and consume more memory, it can be worth it in order to see these speed increases. Comparing FMX execution time to their VCL counterparts, the TListBox is much slower (there is a reason that Embarcadero recommends using TListView for lots of items). At its best (100 items using BeginUpdate and EndUpdate), the FMX TListBox is 3x (XE5) to 6.76x (XE6) times slower. Even using the BeginUpdate and EndUpdate methods, the FMX TListBox is much slower when adding 10000 items, from 72x (XE3) to a staggering 2258x (XE2, without BeginUpdate/EndUpdate) slower. Filling a TMemo, the story is completely different: Delphi XE6 is faster than every other version of Delphi except XE4 when not using BeginUpdate/EndUpdate, and faster than all other versions of Delphi when using BeginUpdate/EndUpdate (even the VCL versions)! Delphi XE5 is the big loser when the BeginUpdate/EndUpdate methods are not used. If they are used, Delphi XE3 has the slowest FMX TListBox. As stated, Delphi XE6 FMX TMemo is even faster than the VCL TMemo, even without using BeginUpdate/EndUpdate; however, the comparison is not fair as the VCL TMemo draws every string as it is added while the FMX TMemo does not. As anyone who has used the FMX TMemo can attest, the FMX TMemo draws very slowly, especially compared to the VCL TMemo. Next week, we will look at the Win64, OSX, iOS, and Android speed comparisons. I apologize that you cannot look at them this week, but the FMX versions of the applications can take a frustratingly long time as has been shown. I am still running speed tests and will report more when I have finished. For now, Happy CodeSmithing! This entry was posted in Coding on May 19, 2014 by tgrubb. For our first tests, I wanted to see how much Embarcadero has been improving the various compilers (Win32, Win64, OSX, iOS, and Android) for each version of Delphi, both in terms of compilation speed and final executable size. I know that this is a trivial part of the performance comparison but I thought it is important to look at every aspect of the application making process. 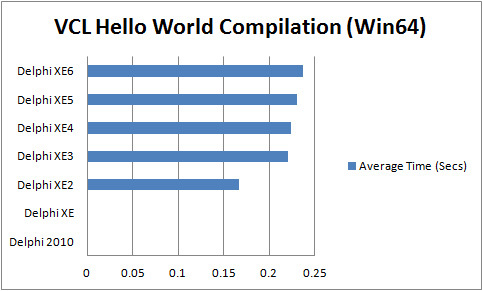 I took the Hello World project described in the introduction and ran it through the various Delphi compilers: 2010 to XE6, Win32, Win64, OSX, iOS, and Android. 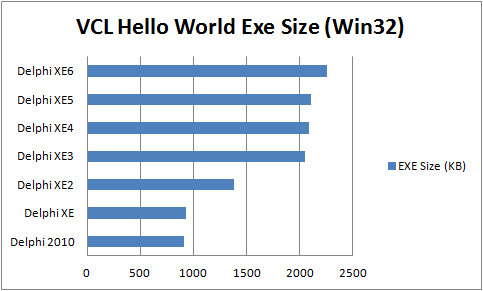 For the Win32 test, all compilers from Delphi 2010-XE6 were used. Every compiler was blazingly fast and with such a small application (101 lines of code), compilation was performed so fast (less than 1/4 of a second) that the difference between compilers looks like system noise. It must also be noted that the Delphi 2010 and Delphi XE compilers were run from the IDE which explains their slower execution. The interesting result, however, is EXE size. It has been apparent for a long time that each version of Delphi has been increasing the EXE size (i.e., code bloat). The results are backed up with our tests. 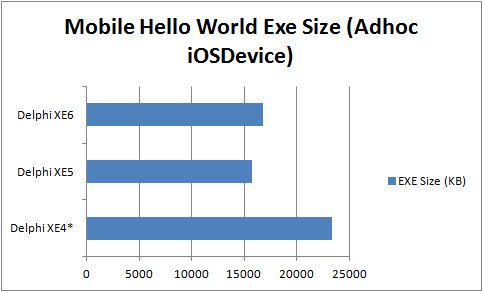 Every version has increased the resulting EXE in size from 914KB in Delphi 2010 to over 2 MB (2258KB) in Delphi XE6. The biggest jumps were from XE to XE2 and XE2 to XE3. Note that this code bloat is not unexpected as every version of Delphi has been adding to the run-time library. Whether you find this code bloat good or bad is a matter of opinion as adding features is IMO a good thing. However, it is a shame that the Delphi linker has not kept pace with development and been aggressive in discarding unused code. With the introduction of Delphi XE2, both Win64 and OSX support were added. For my next tests, I compiled the Hello World application with the Delphi Win64 compilers. Again, compilation was blazingly fast (less than 1/4 second) though each version of the compiler is very slightly slower than the previous one. However, EXE size has ballooned to about a MB more than the Win32 version so compilation differences are probably just hard drive limited. Again, the EXE sizes are increasing with every version of Delphi. Delphi XE did not have a Win64 compiler so we cannot see the EXE size increase between those versions, but the jump from XE2 to XE3 is bad. The compilers for Win32 and Win64 are the same as that used for the VCL application. The difference is the visual component library used (FMX instead of VCL). 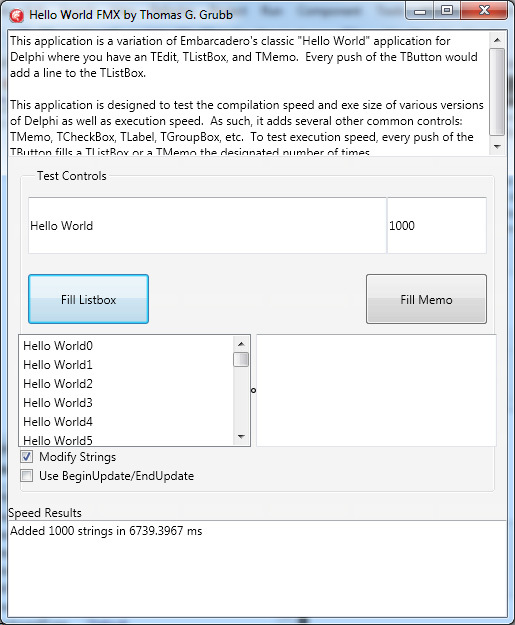 The Hello World FMX application uses TListBox, TMemo, TEdit, TCheckBox, etc, but instead of using Windows managed controls, FMX does all of the work itself. As expected, FMX EXEs are significantly larger than their VCL counterparts. The surprise is by how much (over 2x as large) and how bad Delphi XE3 EXE sizes are (almost 4x larger). Delphi XE4 dramatically improved EXE sizes over XE3 but was not able to reduce the EXE size to XE2 levels. Since then, the EXE size has been slowly creeping up. Compilation speeds seem to track very closely to the EXE size so my guess is that we are seeing HD read/write times. The Win64 results closely mirror the Win32 results. Finally, we get to compare a completely new platform! With the release of Delphi XE2, OSX support was added. We see the same growth pattern of EXE size from Delphi XE2 to XE6, with Delphi XE3 again being the outlier. In this case, Delphi XE6 is very slightly faster than XE5 though I wouldn’t read too much into it. An interesting comparision is to compare the size of Delphi FMX applications on OSX (Win32) to their Windows counterparts (Win32). OSX applications are even larger than their Windows versions, approximately 1.5x to 2x larger. However, the OSX version from XE3 is not as comparatively huge as other Delphi versions. 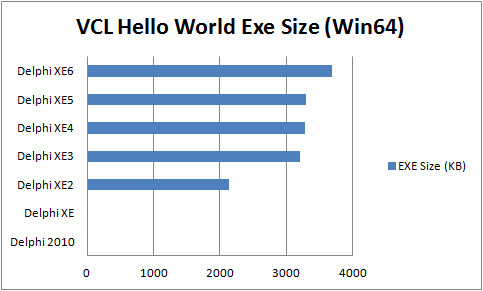 Also, it is interesting to see that the OSX compiler is as fast as the WinXX compilers. I believe that this is because the compiler was written by Embarcadero and does not use LLVM. In Delphi XE4, support was added for compiling and deploying apps to an iOS device (I am going to ignore the free pascal compiler from XE2). This next generation compiler creates ARM code and then uses XCode running on the Mac to deploy to an iOS device. 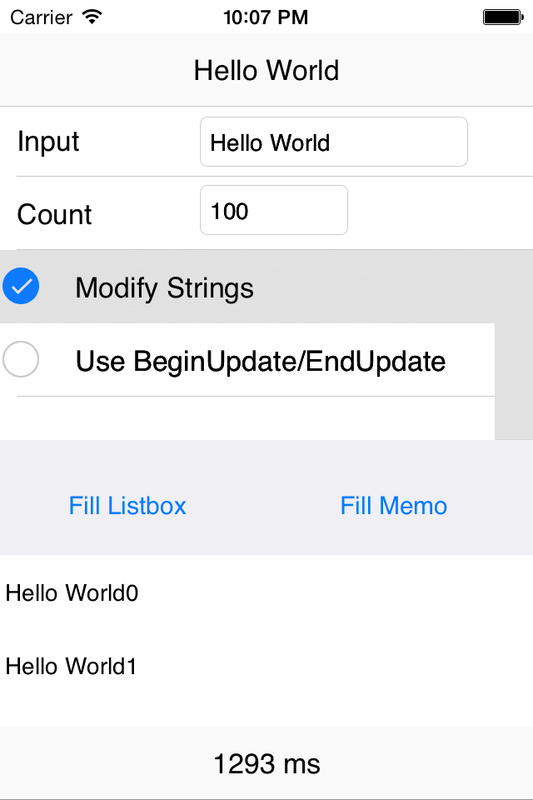 I had difficultly compiling a release version of the Hello World Mobile app for my iPod Touch as I did not want to create a certificate for the app; I had to settle for compiling in debug for Delphi XE4. Note that these tests do NOT include the XCode part of the compile and deploy equation. As predicted and even without the deployment step, iOS apps take significantly longer to compile than Win32, Win64, and OSX. While it is awesome that we can finally compile iOS apps, the compilation process is much slower (over 10x slower than compiling the same app for Win32) and much, much, MUCH slower when you finally deploy to device. 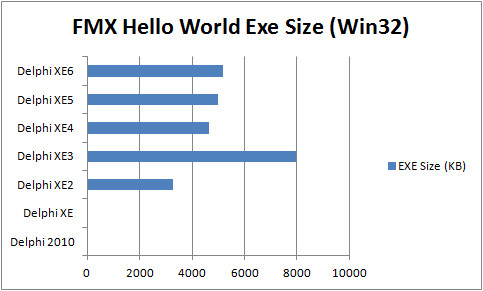 The move to XE6 (ignoring the spurious XE4 results) has not reduced compilation time or EXE size. In Delphi XE5, support was finally added for compiling and deploying apps to an Android device. This next generation compiler creates ARM code and an APK file and then directly deploys it to an Android device. Note these tests do not include the deployment times. They are also executed directly in the IDE instead of the command line. Interestingly, without the deployment step (a big caveat admittedly 🙂 ), iOS and Android EXE/APK sizes are comparable and compile in the same amount of time. 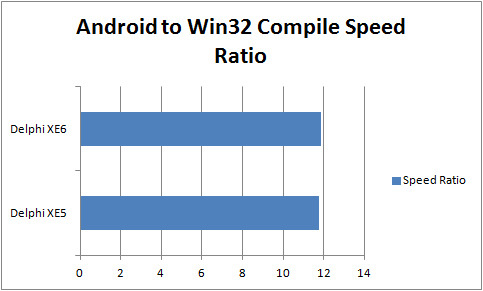 Like the iOS compilations, Android apps take significantly longer (almost 12x) to compile than Win32, Win64, and OSX. 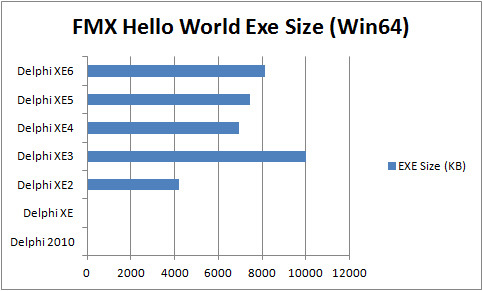 The move to XE6 has not reduced compilation time or EXE size over XE5. Embarcadero has not been doing a lot of work in increasing compilation speed or reducing EXE size. Except for Delphi XE3 which seems an outlier, EXE sizes have been going up slowly but steadily as more is added to the RTL. 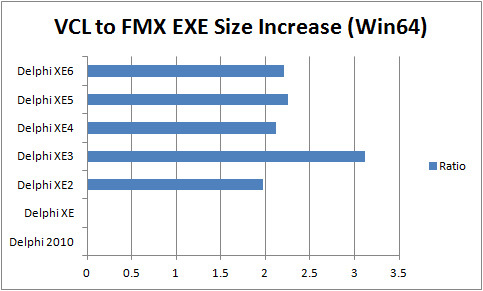 The addition of FMX greatly increases EXE sizes. The ARM compilers are 10x-12x slower than the Win32 compiler even without the lengthy deployment step. Delphi XE6 does not improve either compilation speed or EXE size. However, this is not the most important of Delphi performance. That is all for this week. Next week, we will get to the real speed comparisons and see how Hello World execution speed compares between the different Delphi versions.